Looking for a fine green gemstone with rich color and excellent clarity? What are your choices? The traditional choice is emerald, though emerald is more famous for its color than its clarity. Tsavorite garnet came on to the market in the 1970s and, with the help of Tiffany & Co., became the second choice in fine green gems. High quality tsavorite not only had an excellent saturated green color, but it also had superior brilliance, clarity and hardness. 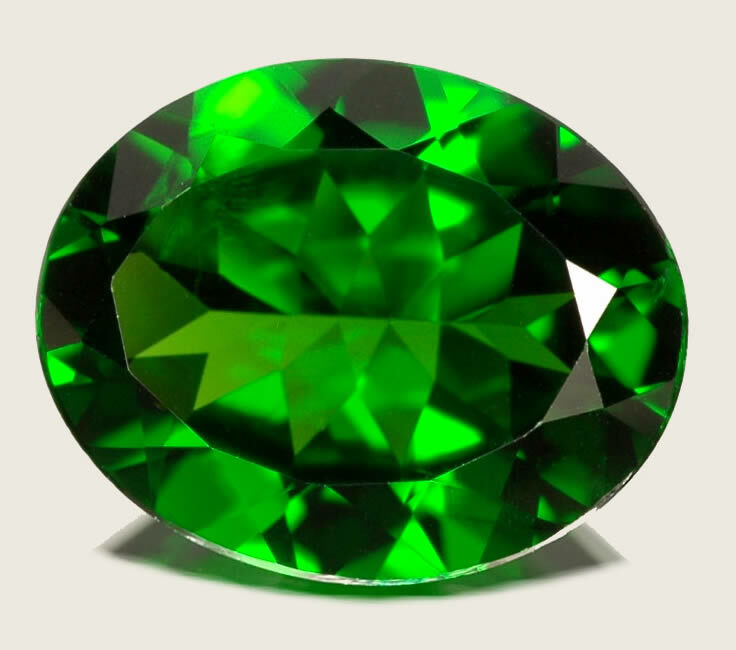 The only problem is that tsavorite became so popular that the prices went as high or higher than those of emerald. The next choice was a rare variety of green tourmaline known as chrome tourmaline. Like tsavorite garnet, chrome tourmaline is found in East Africa, and is colored by trace amounts of chromium and vanadium. Also like tsavorite, fine chrome tourmaline is a pure forest green with a slightly yellowish to bluish secondary hue. But chrome tourmaline turned out to be just as scarce and expensive as tsavorite garnet. The only green gems left were peridot and ordinary green tourmaline. Peridot tended to be yellowish or olive green, and never had the deeper tones of tsavorite or chrome tourmaline. Furthermore, ordinary green tourmaline rarely had the wonderful saturation of the chrome tourmaline. This situation began to change in 1988 when a major new find of chromium-bearing diopside was discovered in Russia. Known as chrome diopside, the material didn't really begin to reach the market until after the Berlin Wall fell at the end of 1989. But finally, there was a rich green gem at an affordable price - under $100 a carat in smaller sizes. The important diopside discovery in Russia was in eastern Siberia, close to the famous diamond mines. This diopside is colored by chromium, the same element that gives the color to ruby, emerald and alexandrite. The color was spectacular; chrome diopside literally glows with green. However, there are a few limitations to this gem. First, chrome diopside can actually suffer from too much green - in larger sizes the tone can be very dark. Careful cutting is required in large gemstones, to keep the angles slightly shallow and improve brilliance. But in small gemstones (under 2 carats) the color is exceptionally vivid and fresh. The other limitation is that diopside is much softer than tsavorite garnet or tourmaline. At 5 to 6 on the Mohs scale, chrome diopside is not suitable for rings. But it is well suited for earrings and pendants, and looks stunning when set in gold. Diopside jewelry should be stored carefully to avoid scratches from harder stones.